Some are saying that the next Harlem Renaissance is poised to happen in Hamilton Heights. And everyone’s got their eye on Columbia University’s planned 6.8 million-square-foot expansion into neighboring Manhattanville—it’s expected to bring an influx of new residents. If you’re looking to get in a little early—or you’re just looking for a decent amount of living space in Manhattan that doesn’t cost millions, this quirky four-bedroom co-op at 616 West 137th Street could be your lucky break. 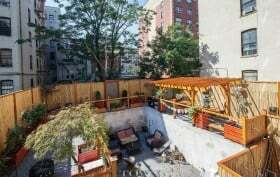 We’re not exaggerating when we say this is one of the most epic backyards we’ve ever seen on a New York City condo. The apartment in question is #1A at 440 East 117th Street, a 10-unit condo out in East Harlem that was built in 2004. What you’re looking at (and likely drooling over) is two levels and 915 square feet of backyard enclosed in bamboo walls. 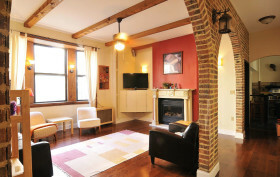 The two-bedroom, two-bathroom interior is pretty comfortable as well, with a total of 1,286 square feet. So what does it cost for all of that indoor and outdoor space? 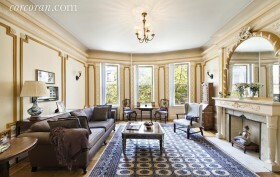 The asking price comes in at $875,000. The ‘American Dream’ may have dominated the last few decades, causing a mass exodus to the suburbs, but today’s families are reversing the trend and turning their attention back to the city. The reasons are many: An appreciation for cultural offerings, the camaraderie and creative cross-pollination of networks of colleagues, friends and family, the convenience of being able to walk or bike to school, work or child care without a long commute—just to name a few. New York City has always been a haven for the forward-thinking, albeit a challenging one. And its newly-”discovered” outer boroughs as well as an unprecedentedly low crime rate have made the city a prime choice for family living. But what is it about those city kids—the ones with parents who planned from the start to raise their kids in a non-stop urban environment? 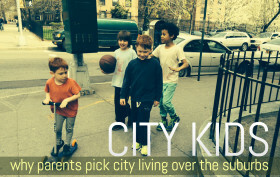 We interrupted the busy schedules of five families currently raising school-age (or soon-to-be) children in New York City’s many diverse and multifaceted neighborhoods to get some insight about why they wouldn’t have it any other way.